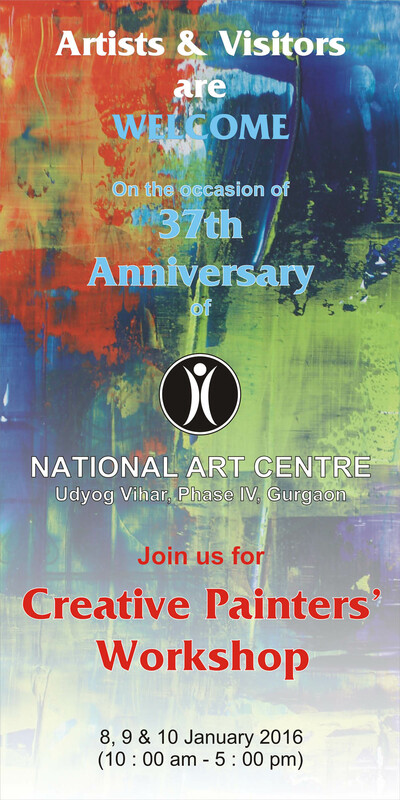 To commemorate the 37th anniversary, we are writing on behalf of ‘National Art Centre, Gurgaon’ and cordially invite you to participate in a Creative Painter’s Workshop from January 8 till 10, 2016. Interested artists are requested to register with the undersigned. Timings of the workshop: 10 a.m. to 5.30 p.m. Dates of the workshop: 8, 9 &10 January, 2016. Venue: National Art Centre, Gurgaon. Easel may be provided on prior request. Size of the artwork (30” x 30” or 30” x 36” or 30” x 40”). The artwork(s) done during the workshop shall be the property of the artist. An exhibition of the artworks done during the workshop shall be displayed in Art Gallery in Delhi. All the participants shall get ‘Certificate of Participation’. If you prefer, some artist from your acquaintance can also participate in the workshop. We hope you are able to accept this invitation and we look forward to hearing from you. The evenings will commence with Tea at 5.30 p.m., with ample time being given for discussion on Art.